It was a chilly - and I mean bone chilling Halloweens night when I met up with Natasha and George for their Lost Gulch Overlook engagement session. I would like to believe that the universe would not provide a soft or warm breeze on All Hallows' Eve and luckily for me Natasha and George were the best of sports in dealing with the whipping wind and frigid cold. I adore Natasha and George for embracing the conditions (amongst many other of their qualities!) and the results were well worth it! It is no secret that the view from the rocks is breathtaking but when I shoot a Lost Gulch Overlook engagement session I always find so much magic playing in the coniferous trees in the surrounding areas! To me, the location is secondary in the making of a beautiful photo. What makes a photo for me is the magic of the moment. These two were not afraid to let go entirely and be themselves during the session and I was able to capture a range of their emotions from their playful flirting and secrets to their serene snuggles and passionate kisses. We did of course make our way to the actual overlook, just in time for the last of the golden light and the most beautiful of cotton candy skies that will leave me dreaming for many, many moons to come. 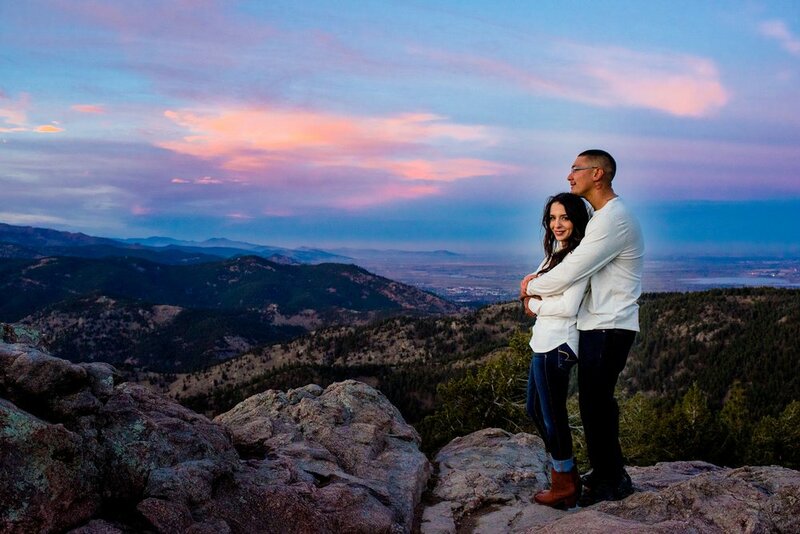 The epic views and the vast sky is one reason to have a Lost Gulch Overlook engagement session! I love a fierce fire sky but the pink and blue clouds of magic will have my heart eternally captivated and I was so happy to get to know these two in this setting. I cannot wait to work with Natasha and George again this summer for their wedding (in warmer conditions thank goodness!) because they are wonderful souls and have a very sweet, genuine and playful love that puts a smile on my face!